The Centre for the Greek Language (CGL) is the official institution authorized by the Ministry of Education to conduct the examinations for the Certification of Attainment in Greek. 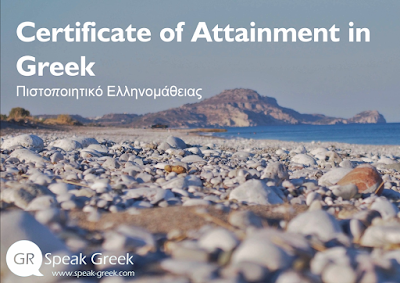 Following the specifications of the Common European Framework of Reference (CEFR) for Languages, the Certificate of Attainment in Greek (Hellinomatheia) is recognised not only in Greece but all over the world. The CGL has been operating since 1994. It is a research institute situated in Thessaloniki. The Centre is supervised by the Ministry of Education, Research and Religious Affairs. Provides to users of the Greek language an expert and objective assessment regarding the level of their knowledge and their language skills. Serves as proof of the successful candidate’s level of attainment in Greek in the work market. Allows foreigners to register at a Greek institution of higher education, in case they do not have a Greek secondary education certificate. Allows citizens of European Union member states to prove complete knowledge and fluent use of the Greek language and thus be employed in a Greek institution of higher education. Learning preparation for the acquisition of the State Certificate of Attainment in Greek (Hellinomathia) is a pedagogical opportunity for students to improve their skills in the Greek language, acquire a rich vocabulary, use the language in communication and develop the following examined skills: Reading comprehension, Listening, Production of Oral Speech, Writing. The book of CGL "CLICK IN GREEK" is the most helpful for the children’s preparation for the examinations and it can be purchased by the CGL. Students by achieving their goal enjoy an early successful experience and enhance their self-confidence in the possession of the Greek language. Parents are objectively informed about the concrete results of their children’s assessment in Greek as a foreign / second language. Teachers are aware of the individual progress and skills of their students. It is a way of evaluating their work and take the best teaching decisions about learning feedback. The Certificate of Hellinomathia is addressed to all: Greek and Cypriot, adults and young people. The number of learners of Greek as a second/foreign language has risen considerably. Programmes for the teaching of Greek to foreigners (including those of Greek and Cypriot origin), to teachers and students, or to any foreigner who wants to learn Greek, are organised by Hellenic Community Schools and Units of Greek Language and Culture. It is of great pedagogical importance for students living in the United Kingdom and other European countries who learn Greek as a foreign language. Especially for students of Greek Cypriot and Greek origin who attend English schools this experience and the knowledge in Modern Greek can be used in order to enter British universities. the General Certificate of Education (GCE)-Advanced Subsidiary Level (AS) and Advanced Level (A Level). The pupils from early years will get familiar with the acquisition of Greek-language and will benefit from learning Greek as a second/foreign language, since it supports and serves the same linguistic skills required by GCSE, AS and A Level. The examinations for the Certificate of Attainment in Modern Greek at all levels are held once annually in authorised test centres all over the world. We would like to inform you that this year the examinations will take place on the 15th, 16th and 18th May 2018. The CGL has the overall responsibility for the operation of the examination centres. Such examination centres have been established in the United Kingdom in London, Edinburgh, Glasgow, Birmingham, Manchester, Bristol and in Cambridge. Candidates should register online. The online registration system will be available from Thursday 1/02/2018 to Sunday 18/03/2018. The students after succeeding in the examinations receive a certificate that proves the level of proficiency in the Greek language. This process motivates them to study the language in depth and follow a rigorous academic program. People who obtain the Certification are recognized worldwide for their language qualifications and can study in universities in Greece, in the United Kingdom, in Europe and in the USA. The Certificate of Attainment in Greek is the only national, officially recognised by the Greek Ministry of Culture Education and Religious Affairs certificate that confirms the knowledge of Greek as a foreign/second language at 6 levels: Α1, Α2, Β1, Β2, C1 and C2. Α1 (elementary knowledge) for children 8-12 years old, and Α1 (elementary knowledge) for teenagers and adults. There is no age restriction for any level. Theoretically, every student over the age of 8 can participate in all levels of the examinations. However, it is recommended that candidates for B2 (good knowledge), C1 (very good knowledge) and C2 (excellent knowledge) levels should be over 16, as the exams' content requires knowledge and experience that younger candidates don' t have. You can find examinations preparation materials for individual candidates. For more information please call the Education Office in London 0044 (0) 2072215977 or visit this website.